“Korpse is a slamming brutal death metal band from The Netherlands founded by drummer Marten van Kruijssen (Houwitser, Beheaded, Cliteater) in August 2013. Together with Sven van Dijk (Visionary666) as vocalist, Mart Wijnholds (DrDoom, Teethgrinder) on bass and Floor van Kuijk (Carnifloor, Fermented Masturbation) on guitar, Korpse became one of the most relentless live acts in their genre. Korpse distinguishes itself by creating an adrenaline powered wall of aggression, turning crowds into packs of bloodthirsty wolfs and turning speakers into weapons of mass destruction. What you hear on the album is what you get live; a relentless display of brutality, without compromises or false overstatements. Immensely heavy slam breakdowns, combined with grinding speed and aggression are the results of Korpse’s no nonsense approach on the slamming death genre. 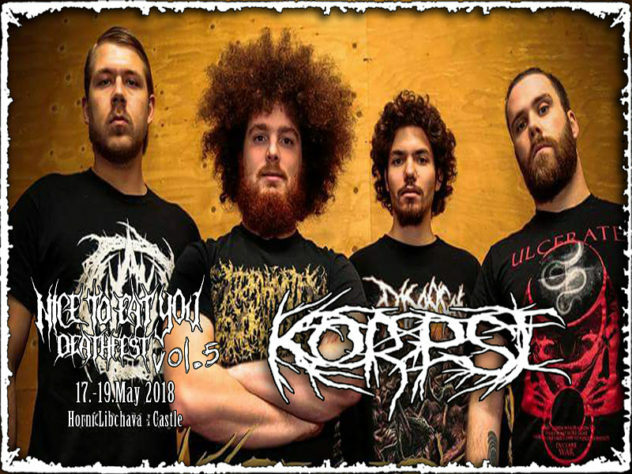 Because of their unique sound, approach, and the fact that all band members have plenty of experience playing all over Europe, Korpse will continue to wreak havoc anywhere their crusade leads them.